Posted on Thu, Dec 1, 2011 : 5:59 a.m.
A room in the home of Elizabeth Nelson's mother in 2006. When Elizabeth Nelson was growing up, she often visited her friends in their homes, but no one ever came to hers. Her mother, and later Nelson herself, was too embarrassed to let anyone see their house. That’s because it was piled high with stuff - bags of papers, stacks of books, mountains of clothing. Nelson’s mother, now 78, is a hoarder, and, despite the proliferation of television shows that capitalize on the shock value of seeing someone practically buried under trash, Nelson said the depths of the problem are little understood. “This is a problem affecting all kinds of people you would never guess,” she said. Nelson, whose efforts to clear out enough stuff to make at least part of her mother’s home livable once prompted her mom to call the police, will talk about the impact of hoarding on family members on Anderson Cooper’s daytime talk show today. The show airs at 3 p.m. on WDIV Channel 4 in Detroit. The show features a hoarding mom and her daughter. Nelson said she was surprised at how uncomfortable she felt during the taping, especially because she was talking about the problems the hoarding was causing for her daughter. She said she found the daughter surprisingly sympathetic to her mother’s predicament. Nelson, 37, is the spokeswoman for an organization called Children of Hoarders. The group maintains a website, and holds monthly support group meetings in Ann Arbor. The organization was founded by a woman in Texas named Donna Austin, but Nelson has been part of it from the beginning. Children of Hoarders website. A support group for adult children of hoarders meets the first Friday of the month at 7 p.m. at Trinity Lutheran Church, 1400 W. Stadium Blvd. Nelson said Children of Hoarders was set up to educate people about the problem of hoarding, let them share their experiences and help them see that they’re not alone. Nelson said people don’t usually talk about hoarding, and people affected by it often try to hide it as her mother did, so they may feel like they’re the only ones dealing with this kind of problem. She said it’s important for people who may have such a problem to get outside help. “It’s not something you can fix by yourself,” she said. Addressing the problem is important not just for the hoarder but for the rest of the family, she said. It was the impact her mother’s hoarding was having on her father that prompted her and her siblings to try to do something about it in 2006. Her sister invited their parents to visit her in West Virginia, and Nelson and her other siblings went to their parents home and tried to clean out the first floor to make it livable. She said they filled a dumpster with trash, mostly from the basement, then moved things from the first floor into the basement to create some livable space. Her mom was horrified when they arrived home to find what had been done. She stayed up all night making a list of the things she said her children had stolen from her. Nelson and her siblings tried to set up a system through which her parents could maintain some sense of order in the cleaned-out rooms, but it didn’t work, she said. Her mother filled up the space again. Finally, in March of this year, when it was clear that her father was going to need to start using a wheelchair to get around, Nelson and her sister took another stab at clearing out part of the house. That’s when her mom called the cops. She said they had their father’s permission to try to make the house more livable, but he was away in a health-care facility. One officer was sympathetic and tried to reason with her mom, Nelson said. But the next day, when her mom called police again, another officer said unless her father was home standing at the door telling them it was OK for them to come in the house and clean, her mom had a right to keep them out. Her mother’s hoarding problem has persisted, Nelson said. She buys bags of clothing that end up sitting about the house. She has bags of mail stretching back to the years when the elder George Bush was president, Nelson said. Eventually, her brother made one room in the house where her dad could stay and use his wheelchair. The rest of the house is inaccessible to him, she said. Meanwhile, Nelson’s relationship with her mother has grown strained. Professional organizers and mental health professionals can help hoarders and their families deal with the problem, which Nelson said is really a mental illness. But her own experience is evidence of the difficulty of getting a hoarder to change his or her ways. Mon, Dec 5, 2011 : 7:38 p.m. If hoarding is a mental illness, why don't family members just take away the ability to pay for stuff...like checkbook and credit cards? Sat, Dec 3, 2011 : 12:19 a.m.
&quot;Ann Arbor woman talks about hoarding's toll on Anderson Cooper's daytime show ...&quot; What toll does hoarding take on Mr. Cooper's show? If he had a nighttime show, would it take less of a toll on that one than the daytime one? Who writes these headlines? These are the pressing questions of our day. Thu, Dec 1, 2011 : 7:03 p.m.
For all of you that are concerned about my sanity or ignorance, I am very aware of the toll that this takes on the family. In the two first hand incidents that I know of the kids grew up to be pretty neat conscious adults. I know their early life was hard because of the embarrassment. One person told me he never had a meal at the dining room table with his family because of the clutter. But his parents were wonderful and he loved them very much as the rest of the kids did. Same with the other family. I think this issue has been out in the public for a number of years but I refuse to watch the Hoarder programs as if they were entertainment. I doubt that you find many hoarders to much degree in poor countries. I would imagine it is more of an American phenomena, or at least more prevalent in richer countries. We have so much, so much junk, or &quot;stuff&quot; as George Carlin said years ago. I was and am objecting to anyone disposing of another's possessions. My mother taught me that you do not steal and really, that is what secretly throwing someone's belongings away is. It caused nothing but grief. How can you write off your mother for good because of a mental illness? Are you that angry and embarrassed? I miss my mother every day. She died in 1996 and she was not a hoarder. Nor am I.
Thu, Dec 1, 2011 : 8:12 p.m.
justcurious, everyone in the situation has to deal with it in their own way, sneaking stuff out is one way to control ones enviornment. Causing your children stress is a form of child abuse, even if there is no screaming, no hitting, no drugs or alcohol, lots of love, nourshment etc. It is a mental illness but it is not normal and children shouldn't have to live like that. Everyones family is different. I helped my cousin cope the best I could as a child. As an adult we can call out another adult on it but as children we don't usually know different and don't have voices to talk back to the brick wall that is mental illness. Yes we smuggled stuff out but we had to do it for my cousins well being and sanity. Some people like you might miss their mother, others though have been pushed out by a hoarder relative and have cut off the emotional loss, some hoarders choose their stuff over people. Thu, Dec 1, 2011 : 5:02 p.m.
Did anyone see that article on another site I believe, where this woman was a hoarder and her bathroom had adult diapers piled to here and while they were talking to her an earthquake hit. This one guy said he didn't want to die under a pile of well you get the picture. It is tragic and yet goes unnoticed. Remember that guy who hoarded puppies and dogs? OMG that house was condemned. We can't pass judgement until we get to the root cause. Might want to check out the TLC channel on hoarding. Especially animal hoarding. Now that is scary. Thu, Dec 1, 2011 : 4:57 p.m.
Thu, Dec 1, 2011 : 10:19 p.m. Funny you bring up George Carlin. As soon as I seen this article I thought about his bit on stuff. It sticks in my head even though it had been years since I watched that bit. I think many people have a few bins of mementos and such, i don't think that is a problem. It is hard to understand why people want to saving stacks, and stacks, and stacks of newspapers and other stuff with no sentimental value. I understand it is a sickness, but it is still hard to understand it as an outsider. Thu, Dec 1, 2011 : 5:09 p.m. Thank you for that 5 minute ditty. I loved it. Now where did I put my stuff? Thu, Dec 1, 2011 : 4:38 p.m.
My aunt is a hoarder, growing up I was the only child that came over to play with my cousin. We made forts among the stuff and found comfort in the basement to play. The house was stuffed, cluttered but thankfully there wasn't rotten food or animal feces around. We were latch key kids so when my aunt was out of the house we would smuggle stuff out to throw away. We would sneak items into neighborhood trash cans. My aunt for some reason ignored the basement. If you moved anything on the main floor she would throw a fit, but the basement she didn't really go down to. We left a &quot;wall&quot; of stuff and then cleared the basement behind it. So literally over many years we cleared out most of the basement without her knowing it. Till this day she is still unaware and that false wall is still there. We did this as children! My aunt also did not intrude on my cousins bedroom, it was clean, uncluttered, dusted by us weekly, so we did have a that, but the rest of the house was packed full. (and thankfully the bathroom was always left clean and useable even if there were unnecessary piles of products that should have been in a cupboard or something). We regularly would have items collaspe on us or slip and fall. The neglect this caused was horrible, my aunt would buy stuff because she could not find something that was buried, she would buy herself new clothes often but my cousin wore handme downs from my sister even as they became thread bear. My cousin was embarrassed and scared someone would find out and tease her about it. It was very stressful, fearing a fit we felt we walked on eggshells regarding the &quot;stuff&quot;. Every opprotunity we have had over the years to enter the house when my aunt was out of town we have taken to smuggle more stuff out. Thu, Dec 1, 2011 : 2:28 p.m.
Thu, Dec 1, 2011 : 2:11 p.m.
Mon, Dec 5, 2011 : 8:47 p.m.
jcj, thank you for that. Growing up in a hoarded home with a parent that values &quot;stuff&quot; more than their own children and/or spouse is not at all pleasant, normal, or nurturing - and it certainly does not instill a sense of self-worth in the children. The actions and behaviors of the hoarder take quite a toll - in many ways - on their families. Thu, Dec 1, 2011 : 11:37 p.m.
Peg Having said all that I am not making light of the seriousness of the disorder or the reality that it does exist. Thu, Dec 1, 2011 : 7:25 p.m. In my experience, it is the perception of the hoarder that they know exactly what they have, regardless of how out of touch with reality that perception may be. My hoarder mother remembers items that are buried, but her memory of those items is distorted to say the least. Most (meaning 99.995%) of the items buried in her piles no longer have the value that she mistakenly placed (and still places) on them when she acquired the items. So yes, you are correct in your rational and reasonable claim that hoarders, in general, cannot possibly know exactly what is buried in their hoarded homes. Sadly, &quot;rational and reasonable&quot; have nothing to do with the hoarders lack of comprehension and warped beliefs as to what, how much, and the actual value of what they own. Thu, Dec 1, 2011 : 6:33 p.m. If a room has been covered 3 feet deep for years how is anyone going to know what is under the pile? Dead cats, rotten food, whatever. Thu, Dec 1, 2011 : 4:42 p.m.
jcj I'm interested to know, on what are you basing the opinion that most hoarders have no idea what they have? Thu, Dec 1, 2011 : 4:40 p.m. I disagree. While my hoarding mother may not be able to list exactly what (and how much) she has, I am constantly amazed at her ability to keep a mental inventory of her stuff - and her ability to know exactly where the stuff is. Also, the point I made wasn't meant to be as specific, such as the hoarder would replace each and every item. My point was, and is, the hoarder would replace what they could remember out of the missing hoard and then add to it, sometimes exponentially. Thu, Dec 1, 2011 : 3:38 p.m.
Thu, Dec 1, 2011 : 2:03 p.m. I agree with several people who have already posted, that this is a terrible way for children to live. Yes, all people, but minor children who have no say in the matter, and virtually no way out of this situation until they become adults and are able to move away. I'm 40ish, and my paternal grandparents, who have passed away, were definately hoarders. My Dad was one of 10 sibs growing up, and when I was growing up, I remember rarely visiting his parents, who lived in the same city as us. I remember going into their house only once or twice, and it was packed from floor to ceiling with &quot;stuff&quot; everywhere. They couldn't cook in the kitchen, and we would walk through little &quot;paths&quot; to get through the home. As an adult, I've talked to my Mom about it, so not to upset my Dad, but she doesn't know which one was the hoarder. Fast forward to present day, and I know two women, in my school zone of Pioneer, who are hoarders. I lived behind one woman and her family, with three children, for almost 10 years. The other woman has three children as well. I have been in both of their homes, and they are very similar to the picture above. It is an embarrassment for their children, who are unable to invite friends over, or if they do, the friends do not want to return for subsequent visits. Both of these women never apologize for the apparent chaos, and I have not seen a dent in the chaos in almost 15 years. It is a very sad situation for the children, in my humble opinion. This is my opinion, and the point is that there are probably *lots* of people around us that live this way. I think this illness is coming to light recently because of the reality tv show, Hoarders, and articles like this one and others that have made their way into the media. I don't know what the answer is, but it is an illness, and many families suffer in silence. Thu, Dec 1, 2011 : 3:27 p.m.
@justcurious: I respect your point as well. It's a very difficult illness, and I personally don't think secretly throwing out someone's belongings is the right thing to do. They have to want help, but in the meantime, minor children do suffer. They rarely ask for help. I personally know that my grandparents' hoarding did have a significant impact on everyone in my family. We were not estranged from my Dad's parents, but we rarely visited their home. I have fond memories of them, taking myself and my sibs to the circus each time Ringling Bros came to town, and huge family reunions every other summer, at a church or a park. As an adult, I now know why we didn't visit their home. My Dad left home when he was 17, eloped with my Mom, and they have been married for 63 years now. His parents' hoarding did have significant impact on all ten of their children, without a doubt. My two friends that hoard, have NEVER acknowledged that they have a problem. I would never say anything; that would jeopardize the friendship. I've talked with many mutual neighbors and friends about them, and no one has ever brought up the topic of hoarding with them. Every square inch of their kitchen countertops/islands are covered with stuff, making cooking/eating in that room a virtual impossibility. It's a very sad situation. Even if they read these articles, or see the shows on tv, I think they still wouldn't admit they have an illness. My point is, that minor children of hoarders do suffer, in my opinion. 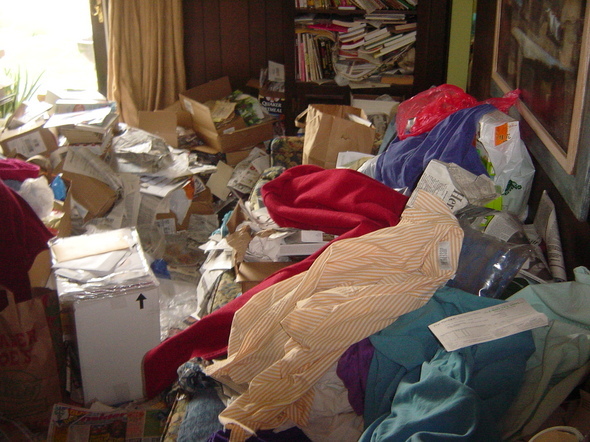 Hoarders simply do not perceive that anything is wrong with the state of their home. Thu, Dec 1, 2011 : 2:48 p.m. I agree with all of your sentiments about hoarding. But my point was that the daughter had no business going secretly to her parent's home and throwing out their belongings. It does not matter that the daughter does nott value the belongings, they didn't belong to her. Thu, Dec 1, 2011 : 1:48 p.m.
Makes me exceedingly grateful for parents who disliked clutter, knick-knacks and anything that had to be &quot;dusted&quot;!! And grateful for the fact that I inherited that trait!! In their eyes, if it wasn't useful or practical, they didn't need it!! I do feel bad for the children in these cases, as some of the living conditions are so terrible and unsanitary. A difficult dilemma for sure. Intervention??? Tough legislation????? Hey folks this is America and if someone elects to &quot;keep&quot; things that is their choice. Most &quot;hoarders&quot; have a depression era mentality that everything has further use and value. They were the first recyclers and were green before green was cool. Now we move to the real news. Thu, Dec 1, 2011 : 11:43 p.m.
InsideTHeHall, would you agree that if someone is electing to exercise their right to keep an inordinate amount of stuff that they must also assume the responsibility for not making it a burden to others in their lifetime and after their death? Rights always come with responsibility and most hoarders seem to 'drop the ball' in this respect. If hoarders actually recycled their stuff, it wouldn't be accumulating to the extent that it does. As for green...that would be the mold that is so prevalent in these un-recycled piles. Thu, Dec 1, 2011 : 9:09 p.m.
Um, what? They absolutely don't recycle. Otherwise they wouldn't save pointless mail from decades ago. Calling the mental illness that is modern hoarding a simple case of depression era mentality is just silly. Thu, Dec 1, 2011 : 1:33 p.m.
justcurious, your comments simply don't sit right with me. As the adult child of hoarder, I can well appreciate that what Elizabeth and her siblings did was based in altruistic concern for her mother and the hazards to others stemming from that hoard. Unless a hoarder lives in total isolation -- cut off from family, friends and the wider community -- it absolutely DOES have a negative impact on others. The vast majority of hoarders, like my own mother, are so very resistant to acknowledging the problem and its impact and to seeking professional help to get a handle on it such that families are sadly cornered into taking drastic steps in its wake. My own 'drastic' actions which have included: kindly and not-so-kindly pleading with my mother to get help, forced unsolicited cleanup interventions, contacting her family physician, contacting my lawyer and her lawyer, contacting our mental health association, and heated verbal confrontations have achieved nothing. I have discovered that the same laws that give her the right to live as she chooses also handcuff the authorities whom we would expect could intervene on our behalf. Out of sheer frustration, exasperation, and self-preservation I have totally estranged myself from her (and her hoard) and she is basically alone in this world at age 78. I imagine that you could easily condemn me for any or all of the things that I have done to SINCERELY try to help her, but unless you have walked in our shoes, there is no way you could possibly know how difficult being in this position is. Thu, Dec 1, 2011 : 11:32 p.m.
justcurious, it will never be my ideal choice, but it is what I have left in the absence of any other viable option. It will have to remain so until something better comes along, and that has not happened yet in the two years we have been estranged. I seek answers every day via research into the nature of the problem, and membership in COH. As long as my mother insists on 'having it her way' by keeping the hoard and not seeking help, then I am equally entitled to distance myself from its effects in any way I choose. Am I to be vilified for expecting the same level of choice as my mother? Choosing estrangement is NOT the &quot;sad thing&quot; to which you refer. What IS truly sad is my mother's failure to accept that she has an obvious problem requiring help, and a judgmental, uninformed society that is quick to place the blame on INNOCENT family members whose inability to effect a resolution somehow makes them culpable for its ongoing nature. For those who would crucify me for walking away from my mother, I happily invite you to assume my role as daughter of a hoarder and see if YOU could do any better. Five will get you ten that you'd be taking the high road before long, too. Thu, Dec 1, 2011 : 2:34 p.m.
Justcurious, it is not sad. To have a parent that values *stuff* more than relationships with their family members isn't sad. To have a parent that makes every effort to keep their hoard but makes no effort to connect with their children, all while resisting the efforts of their children to connect with them, isn't sad. To have a parent that won't visit, yet cannot be visited because of the space constraints and hazards caused by their hoard isn't sad. None of that is sad. It is tragic. So, it is better for you to have estranged yourself and your family from your own mother because of this? That is the sad thing. Thu, Dec 1, 2011 : 1:30 p.m.
Justcurious, I agree that secretly going into a hoarder's home to throw things out is the wrong approach and I suspect that at this point in time Elizabeth Nelson would agree as well. It is now understood that, more often than not, actions such as that simply compel the hoarder to not only replace the missing items but to also add even more &quot;stuff&quot; to their hoard. Hoarding absolutely is an illness, one that is still not completely understood, but the bad consequences are not just for the hoarder. In my opinion, Elizabeth's motivation for speaking up about this subject is not to &quot;out&quot; her mother, it is to illustrate, explain, and shed light on the fact that a hoarder's actions do not just affect the hoarder when there are children and families involved. Being raised in a hoarded home can - and does - have lifelong repercussions for the children of hoarders. I also agree with your point that unless someone is a great danger to themselves and the community, they have a right to live as they please - but the key word is &quot;themselves&quot;. When raising children, a hoarder has an inherent obligation as a parent to provide a clean, functional, and safe environment in which the children can live - and hopefully thrive. I strongly disagree with your opinion regarding Elizabeth's father. Clearly you have never lived with nor enjoyed (I use that term loosely) anything closer than an acquaintance-type relationship with a hoarder such as Elizabeth's mother. Although Elizabeth's father may have &quot;had the right&quot; to change things, it takes much, much more than that - starting with the hoarder themselves recognizing and being willing to address the problem. Thu, Dec 1, 2011 : 6:13 p.m.
jcj, I disagree about the hoarders not knowing if something is missing. Hoarders often know when their stuff has been removed. I have personally experienced this. jcj, I replied to you, but in a new comment. Thu, Dec 1, 2011 : 2:09 p.m.
We don't really know whether both husband and wife were hoarders do we? Thu, Dec 1, 2011 : 1:35 p.m.
&quot;actions such as that simply compel the hoarder to not only replace the missing items but to also add even more &quot;stuff&quot; to their hoard. &quot; VERY few hoarders would EVER know something was missing! So your statement does not hold water. Thu, Dec 1, 2011 : 1:22 p.m. There doesn't have to be a perpetrator and a victim here; there can just be tragedy. It's a severe mental illness and it is extremely intractible. And as with all mental illness, the rights of the sick person have to be weighed against the rights of others -- no easy answers there. This family should be supported, all of them, because they are dealing with something really difficult. Thu, Dec 1, 2011 : 12:44 p.m. This is a terrible way for children to have to live. There should be intervention when children are involved. Looking at the picture, all I can see is a fire trap. With everthing flamable laying around, there seems like there would be no path of escape incase of fire. Can you imagine how fast all that paper and fabric would go up in flames? I would like to hear a fireman's opinion on this. When children are being put in danger, yes, it is time for someone to step in. Thu, Dec 1, 2011 : 8:03 p.m. Seems weird that they (social workers) can take a child away that is morbidly obese (see ohio story) but their hands are tied here? The &quot;no path of escape&quot; is especially scary and sad. Thu, Dec 1, 2011 : 5:14 p.m. I was told as long as they had food to eat, a roof over their head, a place to sleep and parents that made sure they went to school, there was nothing you could do in regards to a parental unit who was a hoarder. Social Workers would love to step in, they can't unless there is cause and having a hoarder parent there is not. Sad isn't it? Thu, Dec 1, 2011 : 12:06 p.m. I believe they were wrong to secretly go to the mother's home and throw things out. Hoarding is an illness and can have bad consequences, but what they did to her mother was wrong. I also believe she is betraying her mother by publicly &quot;outing&quot; her in this way. Believe it or not, unless someone is a great danger to themselves and the community, they have a right to live as they please. It is also hard to believe that her father was just a victim of her mother all of those years. He was the person who would have had the right to try to change things. A friend of mine's parents had the same problem and a wonderful neighbor family does too. But their children never secretly threw their belongings out. Thu, Dec 1, 2011 : 2:24 p.m.
InsideTheHall, OF COURSE she has issues! Elizabeth has issues with growing up in a hoarded home. Would you have wanted to be raised in a hoarded home like the one pictured above? Would you want your children, if you have children, to be raised in a hoarded home like that? Coming forward to talk about this is NOT throwing a hoarding parent under the bus, it is advocating for the minor children of hoarders and raising awareness about both their plight and needs. Thu, Dec 1, 2011 : 12:56 p.m.
Thu, Dec 1, 2011 : 11:36 a.m. They need to pass tough legislation to allow the family and municipality more ability to fight this. It shouldn't be too hard since most hoarding causes fire and health hazards. Anyone who is in a situation like this has powerful OCD which should be considered debilitating and causes risk to self or others. This would make it easier for court intervention. Thu, Dec 1, 2011 : 4:59 p.m. They can't pass legislation on something that is considered free speech and a right to do what ever you want to do within your own home without bothering the neighbors. Sorry, but this is something that needs to be dealt with mentally and physically. No amount of legislation can cure this. Thu, Dec 1, 2011 : 1:41 p.m.
Justcurious, I have two questions for you regarding your reply to Richard asking where he got the information about hoarding causing fire and health hazards. Would you consider a hoarded home where extension cords are strung across, over, and under paper, cardboard, bedding, carpets, clothing, containers of flammable liquid, etc... then jammed into electrical outlets that are smothered by stuff a fire hazard? To that end, would you consider a hoarded home where the hoard, as described in the first question, is covered with and contains mold, mildew, dust, rodent urine/droppings, rancid liquids and rotting food a health hazard? Would you want to live in, or have any relative or friend - or their children - living in such a home? Thu, Dec 1, 2011 : 1:27 p.m. Seriously? Start with the picture above. Then go here: <a href="http://annarbor.com/news/ypsilanti/ypsilanti-township-seeks-immediate-court-action-against-raw-meat-hoarder/">http://annarbor.com/news/ypsilanti/ypsilanti-township-seeks-immediate-court-action-against-raw-meat-hoarder/</a> So, which mess like this isn't a health and/or fire hazard? Thu, Dec 1, 2011 : 12:07 p.m. &quot;...It shouldn't be too hard since most hoarding causes fire and health hazards.&quot; Where did you get that information?